If a 10-year contract is awarded, it also would cover Soldier Hollow, Palisade and Green River venues. 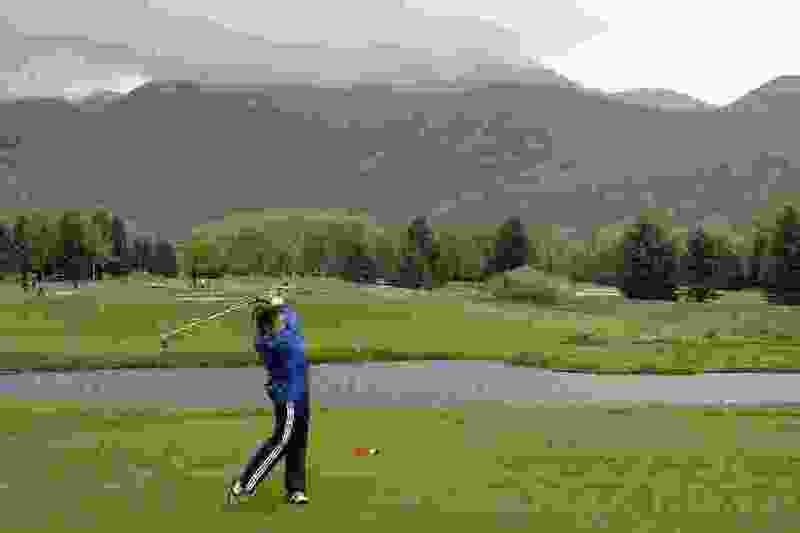 Al Hartmann | The Salt Lake Tribune file Skyline's Rebekah Moon drives in the rain on the first day of the of the 2017 4A girls' golf tournament on the Lake Course at Wasatch Mountain State Park Monday May 16. A private management firm may take over operation of State Parks golf courses in Utah, notably the popular Wasatch Mountain in Midway, following a bid process over the next four weeks. The State of Utah's Division of Parks and Recreation has posted a request for proposals (RFP) for a 10-year lease agreement to operate four courses: the 36-hole Wasatch Mountain and the 36-hole Soldier Hollow in Midway, the 18-hole Palisdade near Manti and the nine-hole Green River. Interested groups are required to make formal site visits Oct. 17-19 and submit proposals by Nov. 7. Officials expect to decide by mid-December whether or not a contract will be awarded, and then make their choice of firms. The Golf Alliance for Utah, an organization that brings together governing bodies of the sport, is not generally opposed to privatizing, said Scott Whittaker, the GAU chair. Yet in the case of the State Parks venues, the GAU would worry about an outside firm’s commitment to all four courses. Whittaker wonders if the lure of running the highly successful Wasatch Mountain would drive firms' interest in obtaining the contract, and if they would be as interested in funding improvements to the other courses. State Parks officials say they are following the state Legislature’s direction to determine whether private operation would financially benefit the state. The GAU successfully opposed a 2014 bill that would have mandated privatizing, basing its stance on a National Golf Foundation study that said the courses were being managed adequately. Several legislators recently followed up by asking the State Parks division to draft an RFP, said Scott Strong, the deputy director of business management. An increase in players' fees is always a concern about privatizing, but Strong has said the rates would remain “very similar,” if a contract is awarded. Utah's golf market is different than in most states, with an unusually high percentage of public courses owned by city, county and state governments. In the past 20 years, private firms created Stonebridge in West Valley City and South Mountain in Draper and later sold those facilities to public entities. In other recent cases, however, management companies have taken over public-access courses in Utah, owning and/or operating them. Such firms have purchasing power for equipment and goods and can apply a standard of operation and increase efficiency across multiple courses. Wasatch Mountain observed a 50-year celebration in 2017, when Gov. Gary R. Herbert played in an anniversary event and said, “I’m pleased that somebody had some foresight and some vision.” The course is a popular destination for corporate and charity groups, thanks partly to having two 18-hole courses on the property. Soldier Hollow, at the other end of Wasatch Mountain State Park, is in the Utah Golf Association’s rotation of State Amateur venues. In 2012, Soldier Hollow staged the U.S. Amateur Public Links, the only United States Golf Association championship ever held in Utah.